Find out more about Applecross Community Hydro scheme and contact Alison Macleod for more information. 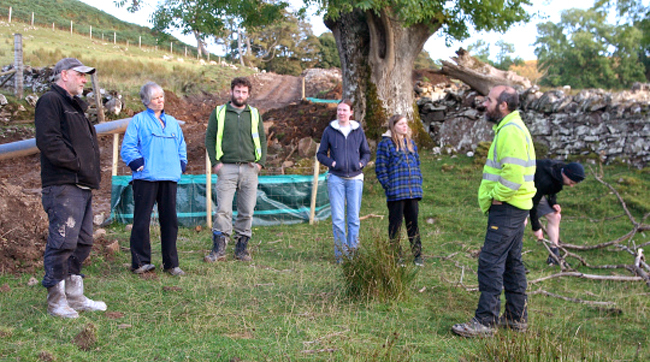 Applecross Community Company (ACC), a charitable trust established for the benefit of the community in 2008, has undertaken all the preparatory work to bring this project to fruition. Much of this work was financed by grants from the Scottish government’s Community and Renewable Energy Scheme (CARES) and the Climate Challenge Fund, but ACC has also invested almost £10,000 from reserves. The project will be developed by the newly formed Community Benefit Society – Apple Juice (Applecross) Ltd – which will be responsible for the operation and maintenance of the installation. Apple Juice was incorporated and registered with the UK Financial Conduct Authority as a Community Benefit Society number 7022 on 7th October 2014. The Society has been set up with three founding Directors: Judith Fish, Ewen Gillies and Alasdair Macleod and is completely independent of ACC. The Society Secretary is currently Alison Macleod. All investors will become members of Apple Juice and are therefore eligible to join the board, which can have up to twelve members. We actively encourage members to become involved in running the company. Installation is being managed by the specialist hydro installer Highland Eco Design Limited who have been awarded the construction contract on a fixed price basis. Highland Eco’s directors Jamie Wallace and Mick Bestwick have worked with ACC since they carried out initial feasibility studies in 2009. Complications and delays in the project development meant that the build on the scheme needed to start before Apple Juice had raised the money required. The board has negotiated a bridging agreement with Highland Eco, allowing them to build the scheme. This agreement is explained in full in the share prospectus.